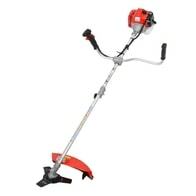 Petrol powered brushcutter equipped with metal blade/string head and shoulder belt. Powered by 2-stroke 33 cc engine. Package also contains a strap, trimmer head, metal blade, tools for blade and trimmer head replacement and measuring dose for mixing gasoline and oil. 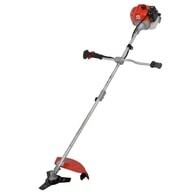 Petrol powered brushcutter equipped with metal blade/string head and shoulder belt. Powered by 2-stroke 43 cc engine. Package also contains a strap, trimmer head, metal blade, tools for blade and trimmer head replacement and measuring dose for mixing gasoline and oil.. 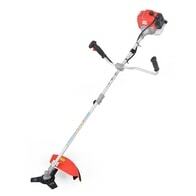 Petrol powered brushcutter equipped with metal blade/string head. Powered by 2 stroke 52 cm3 engine. Cutting width 43 cm. Package also contains a strap, trimmer head and metal blade. 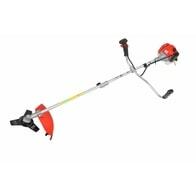 Petrol brushcutter with 2.2 HP engine. Engine capacity 523. Weight 8 kg. Petrol powered brushcutter equipped with metal blade/string head. Powered by 2 stroke 43 cm3 engine. Package also contains a strap, trimmer head, metal blade, tools for blade and trimmer head replacement and measuring dose for mixing gasoline and oil. 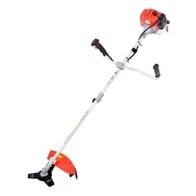 Petrol powered brushcutter equipped with metal blade/string head, shoulder belt. Powered by 4 stroke 33,5 cm3 engine. Package also contains a strap, trimmer head, metal blade, tools for blade and trimmer head replacement and measuring dose for mixing gasoline and oil. Petrol powered brush cutter. String head, shoulder belt and metal blade included in the package.